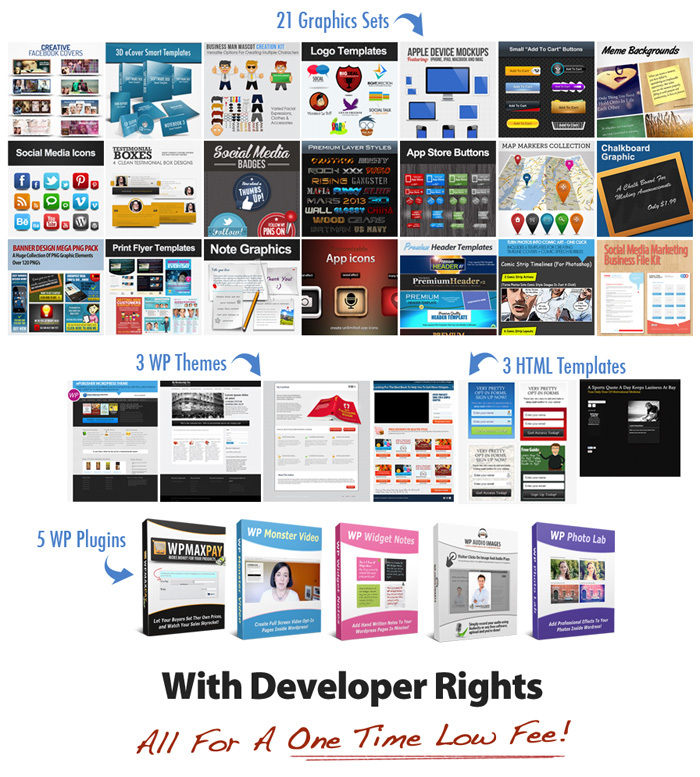 Massive Graphix - Premium Design, Graphics, Plugin and Template Package! I don’t want to write a long sales letter for this offer. The truth is, we all like a good deal, right? Well, how about getting a HUGE library of Premium Quality design source files and templates for just $19.95? That sounds like a pretty good deal to me - And that’s exactly what I have for you on this page. But don't let the low price fool you. All of the content in this bundle is high quality and easily worth at least 10X the asking price. In fact, any one of the items you'll see below can be sold for $27 each. But with this special offer you can grab them ALL for just $19.95. So That’s All Of The Graphics That You Get. 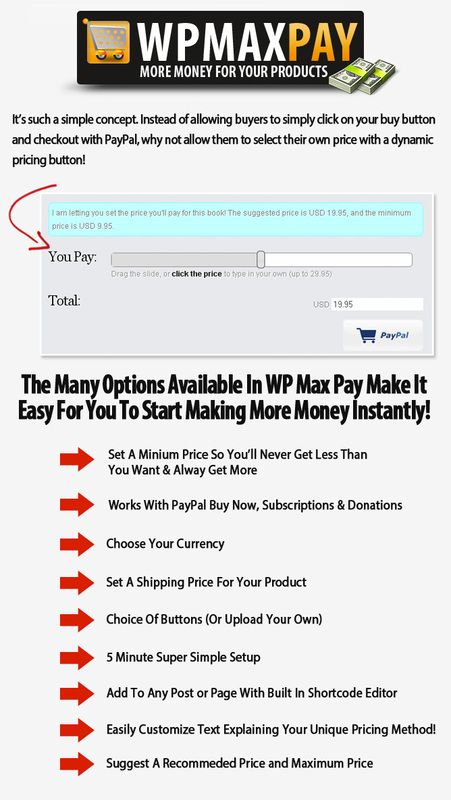 WP Plugin #1: WP Max Pay – It’s such a simple concept – Instead of allowing buyers to simply click on your buy button and checkout with PayPal, why not allow them to select their own price with a dynamic pricing button! This method of allowing people to set their own prices has been proven to dramatically increase conversions, and actually make MORE money. 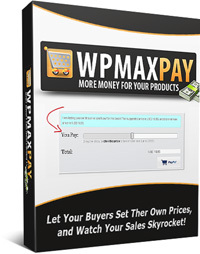 And with this simple to use plugin you can set up these type of dynamic payment buttons literally in minutes! 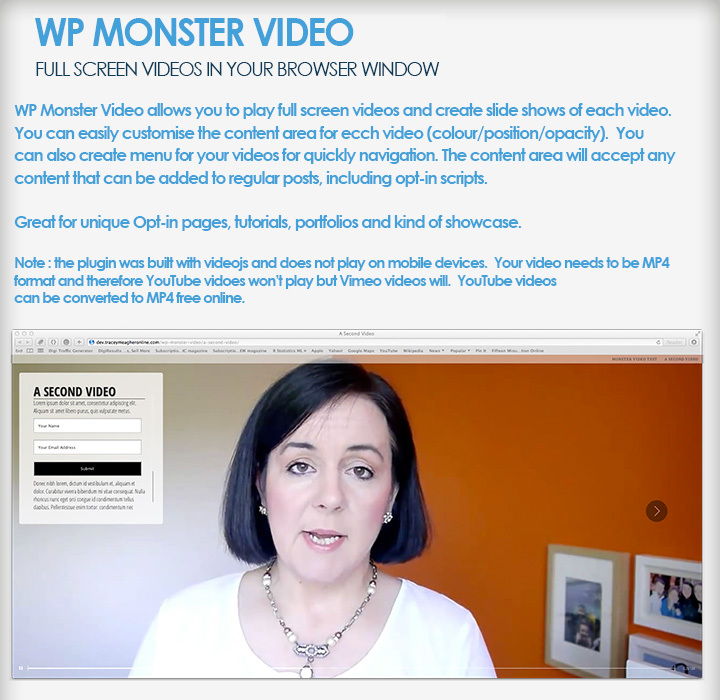 WP Plugin #2: WP Monster Video – This plugin allows you to play full screen videos and create slide shows of each video. You can easily customize the content area for each video (color, position, opacity). You can also create a menu for your videos for quick navigation. The content area will accept any content that can be to regular posts, including opt-in scripts. WP Monster Video is great for unique Opt-In pages, tutorials, portfolios and showcases. WP Plugin #3: WP Widget Notes – This awesome little plugin places attention grabbing notelets in your sidebar. They’ll expand to fit the width of your sidebar or widget area. You get a whole bunch of text styles to choose from along with backgrounds and icons. Unlimited color using a built in color picker. Add any content you’d normally add to any text widget, including images and shortcodes. These are fun and get noticed! 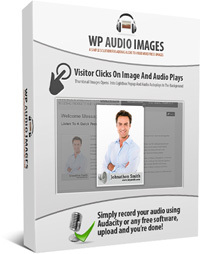 WP Plugin #4: WP Audio Images – The more you can engage your visitor the more you will sell. Imagine being able to add audio to your images and engage your visitors without having to spend hours working through complicated and expensive video software. 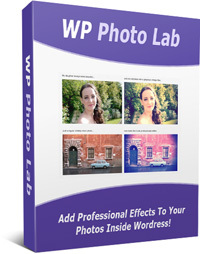 With WP Audio Images you can easily create: testimonials, feature tours, product descriptions, and sales pitches… that will engage and sell your visitors. No need for complicated video production that costs time and money. Simply record your audio using Audacity or any free software, upload and you’re done! 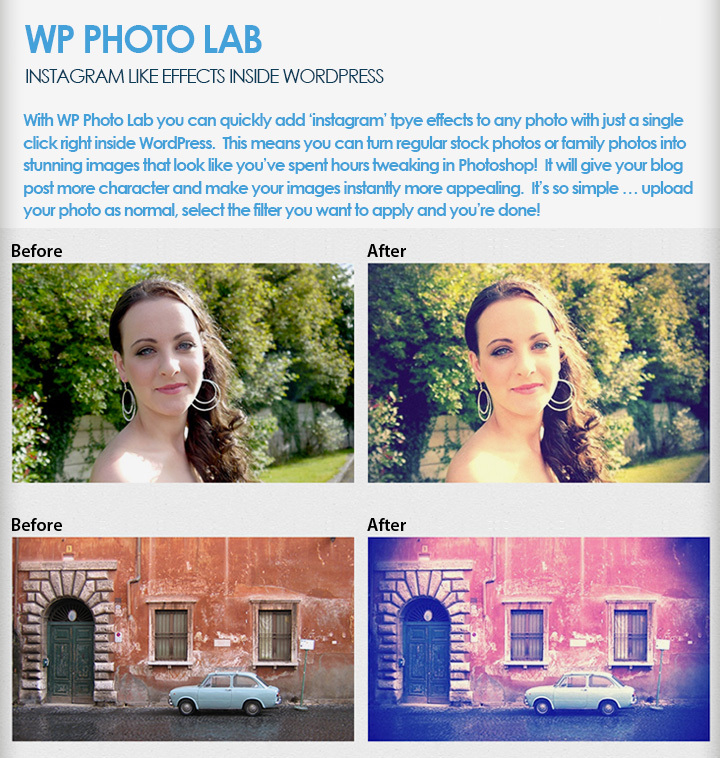 WP Plugin #5: WP Photo Lab – With WP Photo Lab you can quickly add Instagram type effects to any photo with just a single click right inside WordPress. This means you can turn regular stock photos or family photos into stunning images that look like you’ve spent hours tweaking in Photoshop. It will give your blog posts more character and make your images instantly more appealing. It’s so simple… upload your photo as normal, select the filter you want to apply and you’re done! 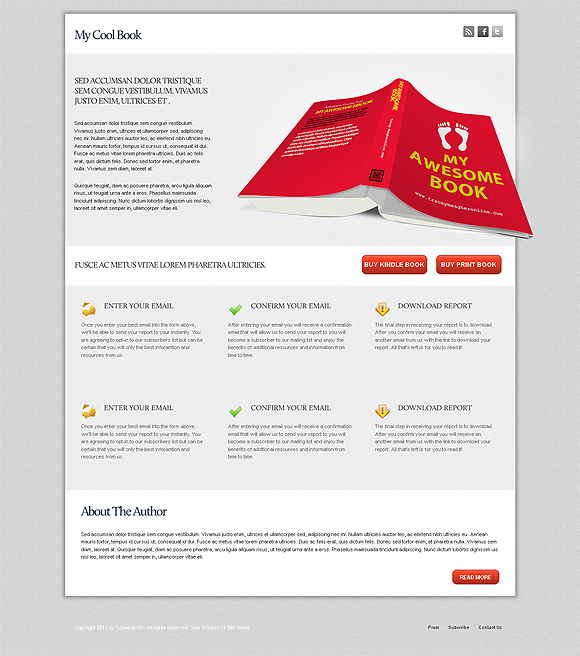 WP Theme #1: Book Author Theme – At last a theme built just to showcase your ebook. The theme allows you to add a featured book on the home page. Links to buy on Kindle or in print can easily be added. An area for reviews is also included. It automatically displays other books on the home page. All of this is controlled from the easy to use theme admin options panel. The background and colors are all easily edited in the theme settings, allowing you to brand the theme to perfectly to your book’s content. WP Theme #2: Clean Membership Theme – Use this theme and it’s integrated plugins to easily setup a membership using the free WordPress plugin, s2Member. The theme provides a handy front-end login, a featured slideshow area on the homepage and an area for featured content. The theme comes in a variety of colors. All setting are easily changed from the theme’s admin panel. 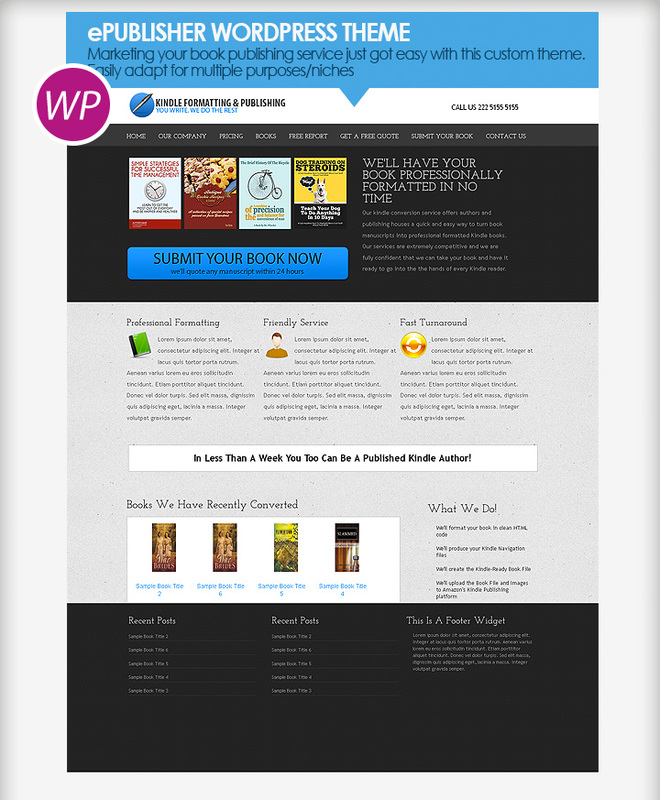 WP Theme #3: ePublisher Theme – Marketing your book publishing service just got easy with this custom theme. Easily adapt for multiple purposes / niches. HTML Template #1: Exit Squeeze Page Template For Ebook Sellers – This template is perfect for capturing sales from exiting traffic. Why not direct visitors to a page before leaving your site or after making a purchase, where they can browse your other products or books. The template includes a lead capture form and area for an image or video. Easily showcase up to 12 product and add links to purchase pages. Add this template to your funnel is sure to increase your sales and profitability. 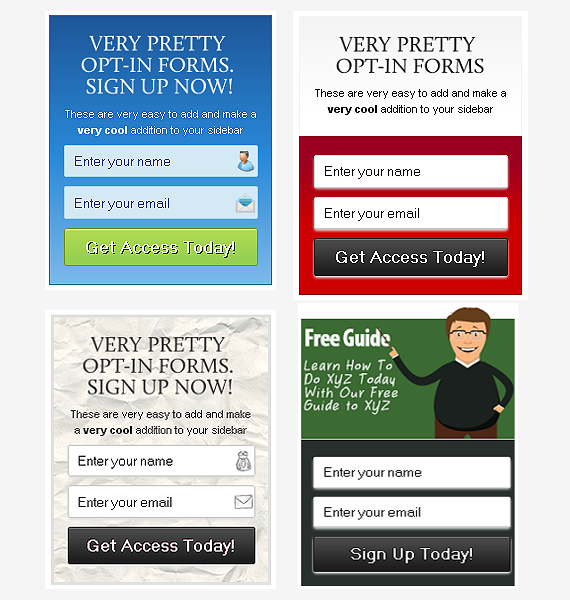 HTML Template #2: Aweber Forms – A variety of aWeber forms styled for a unique look. The templates are easily edited and include a full tutorial. Play around with colors and images for a unique look. The templates can be added to the WordPress sidebar easily, by simply placing the code in a text-widget. 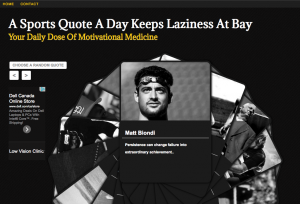 HTML Template #3: Flipping Quotes Website – This is a unique template that will display a range of quotes in an unusual animation that will keep visitors entertained and interested. The template uses unique code to display quotes in a fan shape, allowing the visitors to browse all quotes quickly. The template also includes an ad space for easy monetization. Add an unlimited number of quotes. The template is perfect quickly setting up one page monetized sites and include social buttons for easy viral traffic. Copyright , MassiveGraphix.com. All Rights Reserved.